Unlimited stream PLUS 4 free kiosk rental credits per month!!! 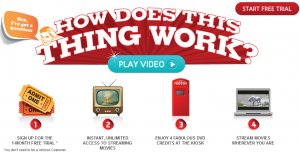 Join Redbox Instant by Verizon for unlimited streaming movies PLUS 4 DVD rental credits at any Redbox kiosk. After trial, just $8/mo and you’ll continue to enjoy 4 Redbox DVD credits every month. And you can cancel at anytime after your trial, that’s how confident they are you will love their service! Each credit is good for 1 overnight rental of 1 DVD. If you keep your DVD an extra night, it just uses another credit. You won’t be charged until your credits are all used up. And the next month it refills to 4 DVD credits again. This entry was posted in Entertainment, Other talk and tagged DVD, PLUS by AustinCouponing.com. Bookmark the permalink.